You might have heard that adding green fruits and vegetables to our diet is leading a healthy lifestyle. But wait, did you take your time and think why you really need the green fruits and vegetables on your diet? Apart from keeping your life healthy, green fruits and vegetables can play a great role in the prevention of common diseases. In most cases, people will ignore the advice on taking green fruits and vegetables as a way of keeping their life healthy. If you visit your nutritionist, they will inform you to take more fruits and vegetables but you do not know how to begin. Common green fruits and vegetables include the avocado, pear, grapes, guava, kiwi, spinach, peas, lettuce, and cabbage. Green fruits and vegetables contain a popular element called chlorophyll. Now, I want to take you into a bit of science here. I know you have heard about chlorophyll before as a great component in plants. Chlorophyll is the same as hemoglobin found in your blood. It contains magnesium and it is used in making of food for the plant by converting daylight into a form of energy. Prevents infection and speeds up the healing of wounds. Stabilizes the sugar in your body. Combines with carcinogens to make them less dangerous to your body. Used in the production of the liver enzymes. If you are already having weak eyesight, remember that is prone to further damage if you do not take your time and maintain it. If you visit a nutritionist, they will inform you to take green fruits and vegetables. The green fruits and vegetables do not necessarily treat your weak eyesight but they will maintain it and prevent it from further damage. Potassium is also a nutrient used to strengthen the tissues found in your blood. With the presence of potassium, your eyes will be stronger and there will be a delay on the onset of eye diseases such as night blindness and cataracts. Having a healthy digestive system in your body is important. The nutritionist will recommend an intake of the green fruits and vegetables as a way of ensuring proper digestion within your body. Cases of indigestion in your body can bring further health complications such as diarrhea and nausea. Such health complications can drain a lot of nutrients from your body. You need to incorporate deep yellow, dark green and orange fruits and vegetables which are rich sources of nutrients used to maintain digestive tract. Deficiency in iron leads to anemia. Treatment of anemia should be carried out immediately. Depriving your body of iron can for a long time worsen the situation. Spinach is a common source of iron in your body. Consumption of spinach is so easy and you can consume it by adding it to your soup or salad. You can also take steamed spinach. By taking the sufficient amount of iron in your body, you will be a step higher in the prevention and treatment of anemia. According to nutrition, you are supposed to serve spinach 3-6 times in a week to prevent anemia and maintain the levels of iron in your body. We all want to look young. Unfortunately, instead of following the right path, we are always looking for short cuts towards having a younger skin. If you are looking for the best way of having a youthful skin, the answer lies within your surroundings. Vegetables such as lettuce and Swiss chard can play a great role in creating flawless skin. The green vegetables and fruits contain vitamins and minerals that get rid of all the skin-damaging components from your body. In a study carried out to evaluate the effect of the green fruits and vegetable on people with high blood pressure, it was realized that the intake of green fruits and vegetables reduced high blood pressure. If you are having high blood pressure, make green fruits and vegetable part of your diet. With the right proportion of the fruits and vegetables, you will prevent the occurrence of high blood pressure complications easily. Numerous studies demonstrate the existence of a relationship between intake of green fruits and vegetables and the prevention of cancer. Most of the studies carried out on the topic are cohort studies meaning that they do follow a large group of people for a long period of years. Information obtained from the cohort studies is much reliable as compared to the one obtained from case studies. The research revealed that taking deep yellow, dark green and orange fruits and vegetables are rich sources of nutrients used to prevent the occurrence of cancer. It is of no doubt that there is an increase in processed foods. Processed foods are the main cause of the increasing level of cholesterol within your body. Cholesterol has far-reaching effects. It can build up in your arteries and veins leading to heart attack and stroke. The best way of making sure you have maintained the levels of cholesterol in your body is the heavy intake of green fruits and vegetables on a regular basis. They will play a great role in getting rid of all the cholesterol that might build up in your vessels leading to complications. Having good cardiovascular health is so simple. The only thing you need to do is to make sure you are leading a healthy lifestyle by eating green fruits and vegetables and going out for exercise. Green fruits and vegetables such as kales, carrots, and cabbage can help you to maintain the level of cholesterol and blood pressure within your body. Strengthening the muscles of your heart is important. It will prevent exposure to stroke and heart attack. Presence of fats in most foods can make you gain a lot of weight. There are many nutrients found in yellow and green vegetables and fruits which can help you shed extra pounds of weight. Most of the fruits and vegetables contain fibers and zero fats. Dietary fiber found in the fruits and vegetables will keep you for long hours by curbing your increased appetite. The green fruits and vegetables are rich in water which helps to get rid of the toxins from your body. What are the Common Colors of Fruits and Vegetables? As a way of making sure you get the benefits of these fruits and vegetables, you need to take a wide variety. Remember that fruits and vegetables come in a wide variety of colors. 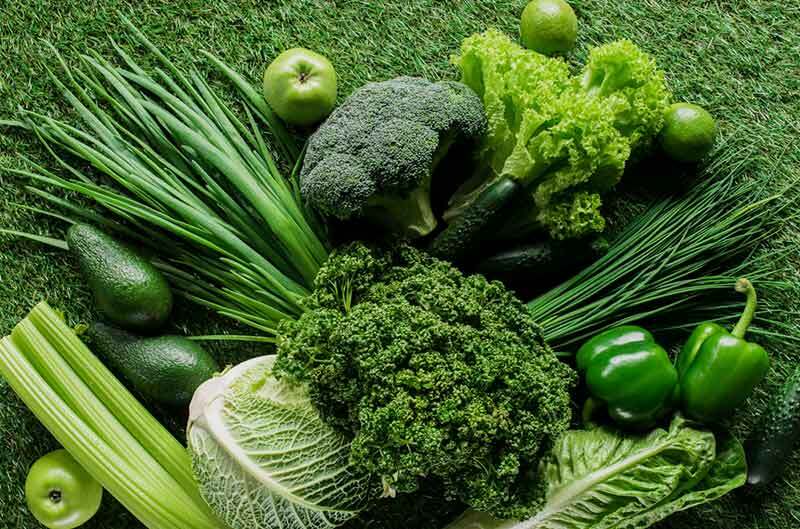 Deep yellow, dark, green and orange fruits, and vegetables are rich sources of calcium, magnesium, potassium, Vitamin A and Vitamin C. Here is the color guide on green fruits and vegetables. It is the common color of fruits and vegetables. They contain a wide variety of vitamins and most of them such as kales and peas contain lutein and zeaxanthin. They can play a great role in keeping your eyes healthy. They are rich in carotenoids. Carotenoids are great nutrients found in foods such as carrots, pumpkin, sweet potato and arrowroots. The human body is responsible for the conversion of beta-carotene found in such fruits into Vitamin A used to maintain healthy skin. It also plays a great role in building your immune system and improving your eyesight. Healthy Tip #1: Taking too many vitamins can be harmful to your body. If you are used to taking the vitamin supplements, you need to change and get them from the fruits and vegetables instead of supplements. Beta-carotene is obtained from this fruits and vegetables according to the requirements of the body. An antioxidant such as lycopene plays a great role in reducing the risk of cancer and protecting yourself against any heart disease. Healthy Tip #2: It is good to cook your tomatoes before taking them. Your body will absorb lycopene when the tomatoes have been cooked more easily. Just before you take the tomatoes, you can light cook them or go ahead and make your own sauce. It is just easy. Just like the orange foods, yellow fruits and vegetables contain beta-carotene used to enrich your body with Vitamin A. They also contain beta-cryptoxanthin which contains strong anti-oxidant properties. Taking yellow fruits and vegetables will help prevent incidences of cancer and they can as well play a great role in the prevention of the inflammatory disorders. Healthy Tip #3: When cooking the yellow fruits and vegetables, it is good to use a little oil. Beta-cryptoxanthin is best absorbed into the body with some oils. How Much Green Fruits and Vegetables Do You Need? That is indeed a great question. If you are in a state of confusion on how much fruits and vegetables you need to consume, then you are not alone in that state. So what is the actual recommendation of the serving of fruits and vegetables? The recommended serving of the fruits and vegetables is two serves of the fruits each day and five servings for the vegetables. It can be difficult to eat all types of green vegetables and fruits to get all the nutrients. The best approach to this is using the rainbow pattern to eat all the fruits and vegetables. The simple thing you need to do is take the above-mentioned colors of fruits and vegetables. From deep yellow, dark green and orange, all these will help you get enough nutrients from the fruits and vegetables. Make sure you have placed the fruit where you can easily see it. Place the readily washed fruits in a bowl where you can easily see it. You will find yourself taking the fruits easily. Explore a variety. Always make sure you try something new. Make sure you take deep yellow, dark green and orange fruits, and vegetables on a regular basis. Trying out something new will ensure you get the nutrients that are not found in other green fruits and vegetables. Make up a recipe- Try cooking some of your meals which contain green vegetables and fruits. Come up with great ideas and include them in your meals. Green fruits and vegetables do play an important role in your body. Taking fruits and vegetables is so easy and most of these foods are available in the shops at relatively lower prices. As a way of making sure you get the benefits of green fruits and vegetables, it is important to make sure you are taking a wide variety of fruits and vegetables. They contain all the nutrients you need. In this era we live where there is so much junk food, the best thing you can do is to take the green fruits and vegetables to keep healthy. The challenge is now yours. Let us go green together.